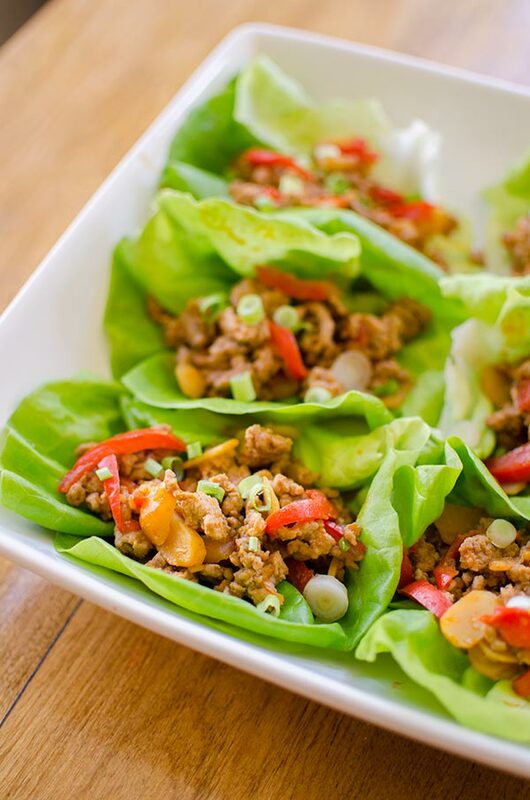 This recipe for ginger chicken lettuce wraps is a healthy dinner made with ground chicken, red pepper and water chestnuts with a simple but flavourful sauce. Lettuce wraps are one of my favourite things to order when I’m out for dinner, but I never tried to make them at home because I thought they would be one of those dishes that doesn’t even compare to restaurant versions. Boy was I wrong. I’m so sorry it has taken me almost six years to share a chicken lettuce wrap recipe with you. But this recipe is worth the wait, these are even better than lettuce wraps I’ve had in restaurants. People are tend to be pretty surprised when they find out that I’ve been running a blog for six years. I’m not the kind of person to talk about my website or my YouTube channel or my Instagram account on a regular basis and find that for me, it’s really important to have some sort of separation between the blog and my personal life. Sure my friends know about it, but it’s not something I typically bring up with someone unless they ask about it. When it does come up there are a few standard questions, mostly people want to know if I create all the recipes myself and when I say that I do, they always wonder how I come up with the ideas. I always laugh, because the recipes are the easy part for me. I have more recipe ideas than I know what to do with! As the years have gone by, the recipe development and testing part of food blogging has become my favourite aspect of running this blog. So, what is the most challenging part of running a food blog? Well, other than the technical side of things (of which I am not very knowledgeable), I actually find the writing side to be the most challenging. After six years, and over 400 posts published (I honestly can’t believe that number), sometimes I feel like I have nothing more to say. Anyways, back to this recipe. 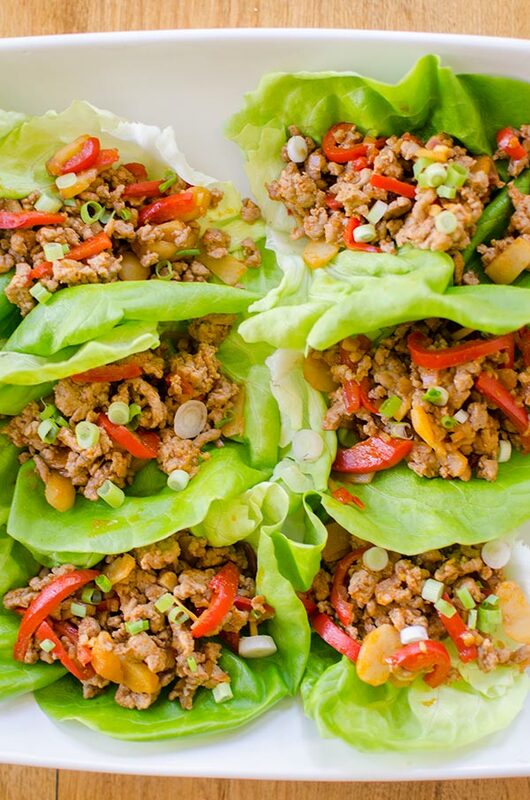 I opted to use ground chicken in these healthy lettuce wraps, but you could also use ground turkey. I’ve added some sweet red bell pepper for flavour and colour, but the secret ingredient that ties this all together are the water chestnuts. They add such an interesting sweet flavour and the perfect crunchy texture that you need in a chicken lettuce wrap. The sauce is an Asian-inspired sauce made with hoisin, soy sauce, sesame oil, lime juice and sriracha. 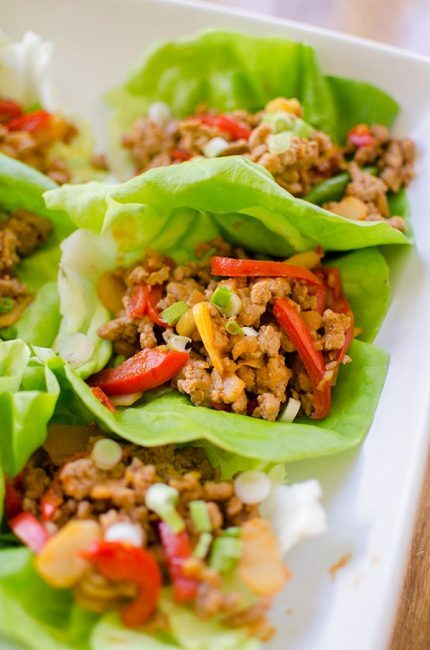 These lettuce wraps have a bit of kick to them, but I find that the combination of flavours in the sauce is the perfect balance (but you can always use a little less sriracha if you want). There are definitely lots of things I wish I could write about on here, I mean I’m 23, I live in Toronto, I went to film school–basically my life is filled with one heck of a cast of characters, whom I love dearly, but I also have immense respect for their privacy. Sometimes I struggle with what I share on here, I write posts and sit on them and they end up gathering dust in my drafts, other times I just hit publish and share more personal posts. It’s a balance. To make the sauce, In a small boil, whisk lime juice with hoisin, sriracha, sesame oil and soy sauce. Set aside. In a large pan, heat canola oil over medium-high heat. Add onion and red pepper, cook for 3 minutes. Add ground chicken, cook and crumble for another 3 minutes until almost cooked. Add water chestnuts, ginger and garlic. Cook another minute. Add sauce and stir to coat. Cook anther 5 minutes. Serve in Boston lettuce leaves and top with green onion. Let me know if you give these ginger chicken lettuce wraps a try in the comments below.